Learn to guide & lead others. Aimed at the Paddler who is comfortable paddling on grade II and III whitewater, but wants the confidence to guide others. Learn the skills to be useful in a group and lead others. Set in the perfect natural classroom of the Soča river, this course will have you guiding, coaching, and making decisions with confidence on class III rivers. We’ve put this course together for both instructors such as the BC Paddlesports Instructor who want to step their game up a notch and regular paddlers whom want a wider skills set to be of use on the river when paddling in a group. We’ll cover everything from your paddling skills and coaching methods to modern, dynamic guiding techniques and real-world group management. This course can include BC River Leader Training and BC Basic WWS&R. We’ll boost your river awareness. It’s not just about how you paddle, it’s about how well you understand your environment. Day 8 After a final review, we’ll drop you back at the airport. 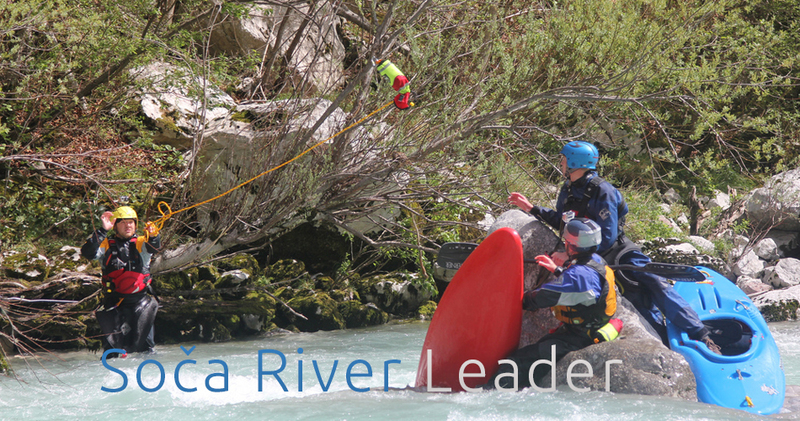 Soča River Leader trip takes place on Class II/III+ whitewater. The Soča River Leader’ trip is suitable for experienced paddlers who are able to paddle for 3 – 4 hours in a day on Class II/III. Generally the rivers are accessible with near road access, but occasionally there may be some exposed terrain. This trip begins on an easier section of whitewater, but will soon reflect conditions expected at the grade. Although not a firm pre-requisites, paddlers on this trip should be able to roll in white water.